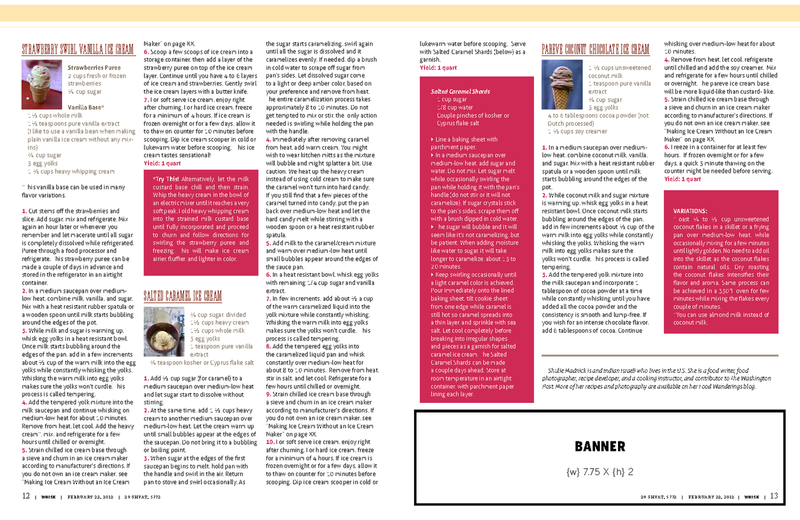 I have recently worked on a super fun article for Whisk Magazine which was published last week, on Wednesday, June 20. I love my editor at Whisk, she is super creative and is an incredible editor. Today I am sharing with you the Salted Caramel Ice Cream with Salted Caramel Shards. Throughout this three part series, I will share in each post different tips and ice cream recipes I shared with the Whisk readers. Having the right equipment handy will make your life easier: An ice cream maker, a medium to large sieve, 2 measuring cups, a wooden spoon or a heat resistant rubber spatula, a small hand held whisk, a sturdy bottom medium non reactive sauce pan (for salted caramel ice cream you need two), heat resistant bowls, a storing container for frozen or churned ice cream, an ice cream scooper, a ladle to scoop warm milk into egg yolk mixture for tempering, just to name some basics. Other additional equipment might be needed based on the recipe. If you don’t own an ice cream maker, after the ice cream base has been chilled and strained, freeze it for an hour. After an hour, process it in a food processor. Freeze the ice cream for the second time for an hour and process in the food processor immediately thereafter. Freeze the ice cream for an hour for the third time and process in the food processor for the third time. Before freezing it, incorporate fruit swirl or chocolate chips or any other add-on that the recipe calls for, mix or swirl gently and freeze for the final time for few hours before serving. Let thaw for 5-10 minutes on counter before serving if frozen overnight or longer. This process mimics the incorporation of air into the ice cream base. It also results in a creamy and delicious ice cream without the ice cream maker. In other news: My photo of ebelskivers pan was published in Tim Carman's article 'Have a ball with Danish ebelskivers' in The Washington Post Wednesday, June 20 edition as well as online (see 2nd photo for credits). Speaking of incredible editors, I love mine at The Washington Post. Both editors improve my pieces a million percent without detracting from the essence of what I wish to achieve. Add ½ cup sugar (for caramel) to a medium non reactive sauce pan with a heavy bottom. Turn stove to low/medium and let sugar start dissolving without stirring the sugar. At the same time, add 1 ½ cups whipping cream to another medium non reactive pan with a heavy bottom. Turn heat on low/medium and let the whipping cream warm up until small bubbles appear at the edges of the sauce pan. Do not bring it to a bubbling or boiling point. When sugar at the edges of sauce pan starts to melt, hold pan with the handle and swirl. Put back on stove and swirl occasionally. As the sugar starts caramelizing, swirl again until all the sugar is dissolved and it caramelizes evenly. If needed, dip a brush in cold water to scrape off sugar from pan’s sides. Let dissolved sugar come to a light or deep amber color, based on your preference and take it off the heat. The entire caramelization process takes approximately 8-10 minutes. Do not get tempted to mix or stir, the only action needed is swirling while holding the pan with the handle. Immediately after taking the caramel off the heat, add the warm whipping cream to it. You might wish to wear kitchen mitts as the mixture will bubble and might splatter a bit. Use caution. We heat up the whipping cream instead of using cold whipping cream to make sure the caramel won’t turn into hard candy. If you still find that a few pieces of the caramel turned into candy, put the pan back on low/medium heat and let the hard candy melt while stirring with a wooden spoon or a heat resistant rubber spatula. Add the milk to the caramel and whipping cream and warm up on low/medium heat until small bubbles appear around the edges of the sauce pan. In a heat resistant bowl whisk in the egg yolks with the remaining 1/4 cup sugar and 1 teaspoon pure vanilla extract. In few increments, add about ½ a cup of the warm caramelized liquid into the yolk mixture while constantly whisking. Whisking the warm milk into egg yolks makes sure the yolks won’t curdle. This process is called tempering. Add the tempered egg yolks into the caramelized liquid pan and whisk constantly on low medium heat for about 8-10 minutes. Take off the heat, stir in the salt and let cool. Refrigerate for a few hours until chilled or overnight. Strain chilled ice cream base through a sieve and churn in an ice cream maker according to manufacturer’s directions. 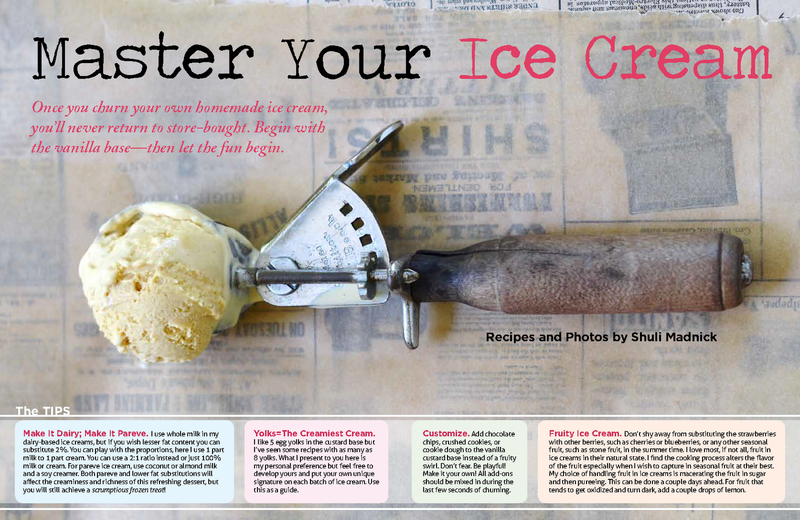 If you do not own an ice cream maker, look at the instructions at the end of the article for alternate directions. Soft serve as is or freeze a minimum of four hours. 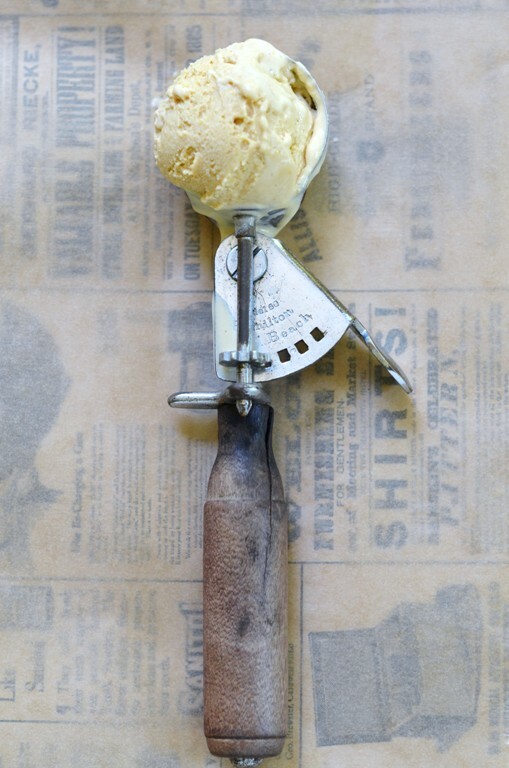 If ice cream is frozen overnight or for a few days, allow it to thaw on counter for 10 minutes before scooping. Dip ice cream scooper in cold or lukewarm water before scooping. Serve with Salted Caramel Shards (below) as a garnish. In a medium non reactive sauce pan with a heavy bottom add a cup of sugar and 1/8 cup of water. Put pan on low/medium heat, but do not mix the sugar and water. Let it melt while occasionally swirling the pan while holding it with the pot’s handle. If sugar crystals stuck to the pan’s sides, scrape them off with a brush dipped in cold water. The sugar will bubble and it will seem it’s not caramelizing but be patient. When adding moisture like water to sugar, it will take longer to caramelize, about 15-20 minutes. Keep swirling occasionally until a light caramel color is achieved. Pour immediately onto the parchment paper lined cookie sheet, tilt cookie sheet from one edge while caramel is still hot so caramel spreads into a thin layer, and sprinkle with sea salt. 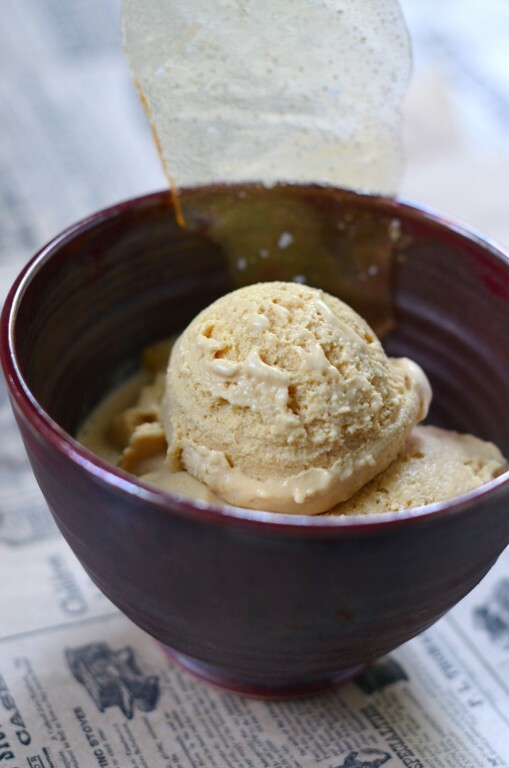 Let cool completely before breaking into irregular shapes and pieces as a garnish for salted caramel ice cream. The Salted Caramel Shards can be made a couple days ahead. Store in an air tight container, lay flat on parchment paper, while each layer is lined with parchment paper. Store salted Caramel Shards in a cool place on the counter in an air tight container. A divine ice cream! It sounds just amazing. TY as always sweet Rosa! yummm! SHARDS! i love shards! i will make this for july 4th. Very cool. Let me know how it turns out. You can reach out if you have a question while making it. Looks perfectly delectable! And for kosher keepers or vegans hankering for non-dairy frozen treats, check out the JUST released VEGAN A LA MODE, by Hannah Kaminsky. She combines unexpected flavors (and some basics ,too) to create tantalizing non-dairy, frozen treats. Ooh I will check it out. Sounds incredible. Thanks for letting us know. My last one in the series in Parve and dairy free. Stay tuned! amazing indeed! My favourite is still a simple honey or maple syrup ice-cream! But actually ANY flavours will do!! Ooh Anh sounds heavenly! Never had simplt honey or maple syrup I bet I would love it! now that ice cream looks to good for words! I absolutely love caramel and salted caramel, takes it over the top! TY Dennis. Believe it or not I am a recent convert. I never tasted it until two years ago. I always thought the salted caramel sounds ludicrous and then I tasted it and I became an instant convert! Absolutely perfect! Can't wait to try it. TY. Let me know when you do. This is great, Shulie! Congrats on the article. The ice cream looks magnificent! 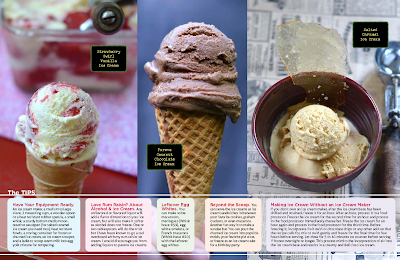 My favorite flavor hands down, this week ;) It's a great synopsis of ice cream making. Thank you Georgie so happy to hear it;s your fave. More tips and my personal preferences coming in the next couple of posts. I love making my own Ice Cream. Lovely article, congrats on such a great feature! TY so much Carolyn. very sweet of you. Which flavors do you churn? 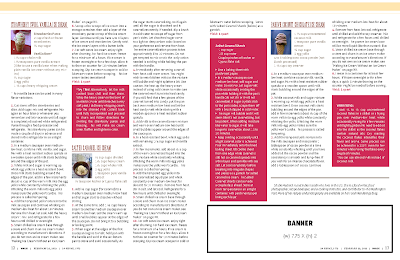 Your photos look fabulous in print! Can't wait for the remaining recipes! TY Chinmayie. next one is coming this Friday. You should. You will never go back. I haven't bought tubs of ice cream in supermarkets in years. The only exception is if we go out to a restaurant or just a gelato or ice cream shop in DC or on vacation. Love, love, love the sweet and salty combo! I know, right?! & read my response to Dennis. Hard to believe I was resisting it! I am making it now to celebrate the end of the school year!!! Tastes great. Super excited! Let me know how it turns out! Great Ice Cream making tips! Here is a link for my latest Ice Cream creation http://bit.ly/Lkb9mH Chocolate covered pistachio ice cream.